Today would have been my dad's birthday. And as a World War II history buff, I would have wanted to give him this book. He would have loved it. I was glad when this date was offered to me to participate in a book tour for World War II Heroes of Southern Delaware because, for me, it's a good way for me to remember not just the sacrifices of men and women who fought for our country, but also to remember my dad. This book does focus on heroes from a specific area of the country, but they might as well have been from all over the place for the stories that they have to share and to tell. Originally published as a series of newspaper articles, James Diehl compiled all of the stories together in book form for easy reading and distribution. What you'll find within these pages are testimonies of courage and bravery of 50 people, 48 men and 2 women. These people served in a variety of ways during the second World War. Some saw action, some did not. Some simply "did their job" in payroll and served there as well. Each played an important part in keeping American troops operational and helped fight to end injustice and defeat the enemy. Each person in this book seemed to think very little of their individual roles, but saw themselves as a collective unit - a united force, working together. The people in this book didn't even know each other but they were part of a team and share a common bond as a result of fighting in a remarkable and defining point in history. 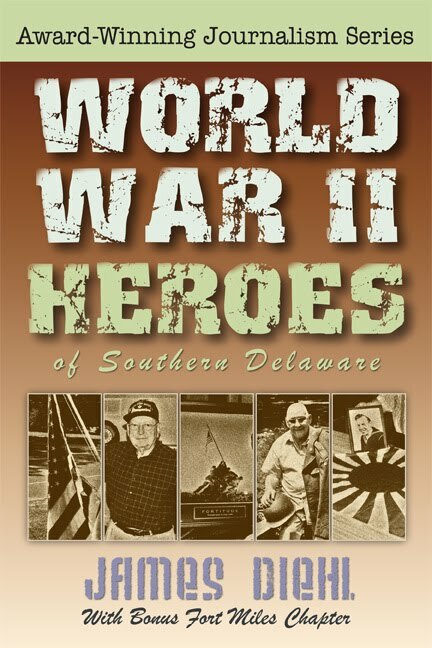 World War II Heroes of Southern Delaware is a quick and easy read, because it was originally published as a series of newspaper articles. Each "chapter" represents one individual and one story. The stories are proceeded by a picture of the World War II veteran as they look now, as well as pictures of them from their days in the service. We read about chaplains, men in charge of finding entertainment for the troops, and men like Bill Martasin who served in Patton's Third Army. Martasin also found himself on Midway Island, using "gooney bird" nests as foxholes. Fascinating stories from around the world, and yet conclude somewhere in Southern Delaware. African Americans, white men and women, serving in a myriad of ways: Army, Navy, and the Coast Guard. Yesterday I introduced the book Franklin & Winston to you, which talks about two men who made decisions as to where to send their armies to fight against Hitler. 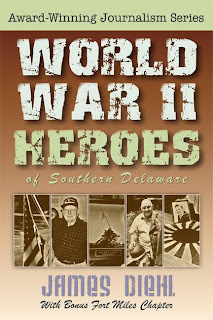 World War II Heroes of Southern Delaware talks about the men who were sent. Personal life stories are shared within these pages and they are beautiful to hear. If you have a World War II buff on your Christmas list, I highly recommend this book of true stories, told by the men and women who served, as an educational and inspiring read. Dad, you really would have liked this one. I'm sorry not to be able to share it with you but I know nothing compares to the beauty and the joy you are experiencing today in Heaven. Happy Birthday! Thanks for reviewing my book Carrie! I'm glad you enjoyed it; you really seemed to grasp the essence of it quite well. It is about people who live today in southern Delaware, but it is certainly not about this area. It's about those wartime experiences, as you certainly state very eloquently. Thanks again! I feel the same way when I see books about Vietnam. My dad died 10 years ago, and I was glad to have been able to discuss some of the books I was reading on college on the topic before he passed. Great post, Carrie. I'm thinking of you and your dad today!